The WWW’s similarities to the idea of “nature” are too numerous to to list. The web links all of its hypertext contents in ways that allow a user of one URL site to access all other sites in hyperspace. The hypertext web links nodes of information in ways that tie similar ideas close together and allow dissimilar ideas to be connected through often complex sequences of transmission. The poet Shelley–in his poem “Alastor”–sees nature as a “vast frame” and connects it to a “web” of human things that are all parts of this natural world. These uses of the word rely on our sense of a “web” as an interlinked and often intricate pattern of ideas, events, or things. 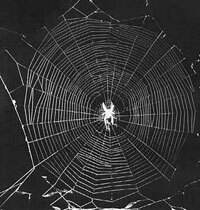 So a “web” of circumstances can entrap the criminal in its facts, a “web” of lies can deceive an honest person, and a spider’s “web”–the physical origin of the term–is composed of one of the strongest substances in the material world. The strength of this silk is the result of a series of proteins that combine to produce a powerful strand of molecules; the properties of this silk are also related to the fact that it is not one substance but can be composed of as many as seven different compounds, each of which emerges from a different gland in the spider’s amazing abdomen. The fossil record suggests that spider’s web are at least 140 million years old, emerging first as forms of bodily protection–and later hunting tools–when spiders migrated from aquatic life to life on land. So Shelley gets it right: the human web is just one part of the vast frame of nature, and he intuits the notion that the web of human things, from birth to death and everything in between, are not now as the once were, nor will they be the same in the future. The very nature of our human web, like the World Wide Web we humans have created, is to be every changing, ever evolving, a dynamic set of links like a spider’s fibers.Unlike a spider’s web, our human web is not designed to entrap but designed to hold all of the information, all of the ideas and images, that homo sapiens has been able to produce.